Maintaining the quality of the water supply is the top priority for municipal drinking water treatment plants across the country. Water plants use several treatment processes to ensure water quality and safety, and these treatment steps include disinfection. Traditionally, chlorine is used in both primary and secondary disinfection treatments and has been used since 1908. 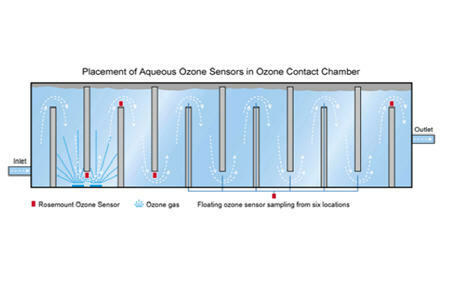 Some water plants are moving to ozone for primary disinfection. One water utility that is taking this direction is Newport News Waterworks, located in southeast Virginia. Newport News Waterworks constructed a pilot plant eight years ago that uses ozone in the primary disinfection process. For this pilot plant, Newport News selected Rosemount ozone measurement systems from Emerson. These analyzers are used for continuous measurement of ozone in the ozone contact basin. Based on the success of the pilot plant, the Harwoods Mill plant at Newport News switched from chlorine to ozone for its primary disinfection process in March 2002. Both surface water and some ground water sources can contain many different pathogens (bacteria, viruses and parasitic protozoa), some of which are potentially lethal. These water sources can be contaminated by these pathogens, so water treatment plants render these pathogens inactive through a combination of chemical disinfection and filtration.